So far, my foray into anything resembling sport (bar several years of feigning various injury in an ill-fated attempt avoid gym/hockey/cross-country lessons at school) has been limited to drinking a bottle of Lucozade whilst running for the bus. So it was with a hint of trepidation that I decided to accept an offer of a weekend in the countryside marred by the promise of having to try out an Olympic sport to justify it. After 35 years in my mortal shell I have accepted what it will and won’t do and that includes anything resembling cardio, but with Olympics fever in full swing I have to admit to feeling the teensiest bit left out and on discovering that my assigned sport of choice was archery, I actually felt what could be described as a pin-prick of excitement. Rather aptly, my immersion into my Olympic training was to take place in Nottinghamshire, home of Robin Hood and also the rather stately-looking Thoresby Hall, a Warner Leisure Hotel which may lack the kudos of your Babington Houses, but whose glorious gardens and imposing exterior were a welcome break from the battle of the pashmina-brigade. After a rather impressive meal in the ‘Blue Room’ restaurant (strangely at odds with the Abba tribute taking place at the other end of the hotel), I felt that my reserves were suitably stoked for my lesson the following morning. According to my rather strapping instructor, Gavin, the object of the sport is simple – to shoot arrows as close to the centre of the target as possible. Simple enough, right? Well not if your arms are the human equivalent of withered twigs. As he handed me the, in my eyes, rather rudimentary bow (I was expecting something a bit more crossbow-like in the vein of James Bond), initially it didn’t seem too taxing. Once you’ve strapped on a protective leather arm-guard, it’s simply a case of holding the bow in your left hand with a slight bend in the elbow, locking in the end of the arrow to the string, pulling back until the hand with the string is touching your jaw and letting go. I reiterate that it didn’t look too taxing ‘initially’. After half a dozen shots, both arms were already aching and the tips of my fingers were red raw from pulling back the string. But after getting increasingly closer to the yellow centre (the target face is divided into 5 concentrically coloured rings which are each divided by a central line), I was beginning to see how this could become quite addictive and Gavin confirmed that most of the guests he‘s taught (who admittedly are largely retired) end up taking up the sport once they get home. William Tell I ain’t, and an hour’s lesson was more than enough for one day (I was deliriously grateful of the massage afterwards in the World Spa to sooth my aching muscles) but it’s definitely something I’d consider doing again. The Lord Of The Rings Trilogy may have prompted a 10% increase in UK archery club members, but I‘m predicting the Olympics will bring out a new wave of budding Merry Men (and women) and I might just be tempted to join them. Two nights in a Historic Room will set you back £278 per person which includes a three course dinner and full English breakfast and you can currently save up to 40% on July and August breaks. For more information go to warnerleisurehotels.co.uk/hotels/thoresby-hall-hotel. 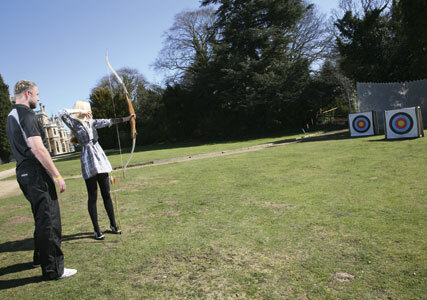 To find out more about the sport as well as to locate your nearest archery course go to archery.org. Top tip: Concentrate! No, really concentrate! Book now: In July two nights in a historic room at Thoresby Hall (warnerleisurehotels.co.uk) costs from £278 per person including breakfast, dinner and activities such as archery, fencing and shooting.